Medical technology does not always have to be about complex devices - Lifeline Corp's latest product simply involves reinventing the wheel. The wheels on a wheelchair often get in the way of someone trying to move between it and the bed, car, toilet or any other seat. 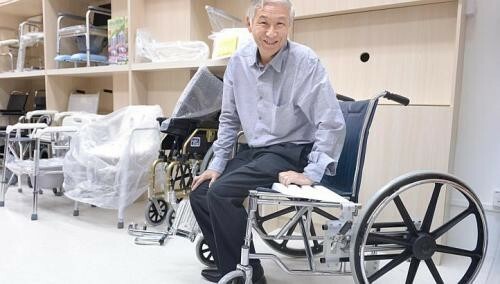 To make transfers easier for wheelchair users, researchers at Nanyang Polytechnic developed a wheelchair with a retractable wheel - "a simple innovation, but no one had done it before", said Lifeline's managing director, Mr Michael Pang. The company, which has four stores here carrying products catering to the elderly and the handicapped, decided to commercialise the product. It is expected to be available here by April, with the first shipments abroad going to Norway and Mexico. A regular wheelchair costs about $500, while the transfer type will cost an additional $300. "This is the first made-in-Singapore product we will be selling," said Mr Pang. "I am proud that a local institution was able to do something like that."